SCAM WARNING FROM SIA, "YOU HAVE WON AIR TICKETS! You are at:Home»Caught In The Act»SCAM WARNING FROM SIA, “YOU HAVE WON AIR TICKETS! SCAM WARNING FROM SIA, “YOU HAVE WON AIR TICKETS! Yet another kind of scam going around the internet. Every now and then Internet users tend to encounter some websites that contents pop-ups. Most are advertisement but there are quite a few that are actually scams. 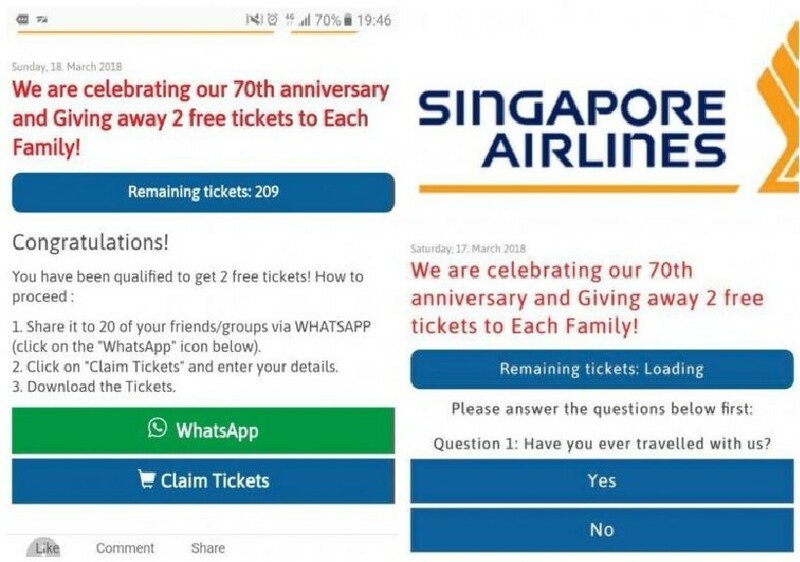 A netizens encountered one recently which promises SIA air tickets, furthermore the scammer wants you to share it with friends and fill up personal information. Most of the times scams like this will end up stealing your personal information or end at a page asking for credit card details.